Munch your way through 120 rooms of delicious puzzles with your team of hungry animals. Chocolate Castle has a variety of styles of puzzles made out of turkish delight, snakes, ice cubes, magic walls, and sliding blocks. Oh, and there's also a fair amount of chocolate involved. 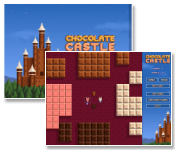 The demo version of Chocolate Castle has 12 rooms and lets you try out the room editor (4 levels for each difficulty setting). The object of Chocolate Castle is to eat all of the chocolate in each room. There are four types of chocolate and four types of animals to eat them with. To eat some chocolate, click and drag an animal into it and both of them will disappear. You can also click and drag chocolate to move it into an empty space. If you put two pieces of the same colour next to each other, they will stick together. You can eat more chocolate with one animal by doing this, but be careful because once they are connected, they can not be separated! If you make a mistake, you can rewind to any previous move my pressing the UNDO button. Replay moves by clicking REDO, or by pressing Enter. "Deceptively cute. This game doesn't look like much at first glance, but those fluffy animals and deliciously shiny chocolate morsels conceal a mighty cerebral puzzle experience." "All the elements are in and perfect. There are a small set of different puzzle elements, but each one greatly expands the possibilities, all of which are explored over the course of 120 levels." "It's such a delightfully simple concept that can lead to some extremely fiendish puzzle play and if you're a puzzle game fan I suspect this should be in your "must-have" collection. Apart from the huge number of puzzles it appears to come with there is also a level editor which should extend its play life too." "Seriously, don�t let the small install size trick you into thinking this game isn�t big on gameplay, because it is." All this for only $19.95! So what are you waiting for? Order now!